Compatible with all mobile devices. iPhone, Android, Nokia etc. Intersalon was the first to make online appointment booking and online customer account management available to all salons. Now we've introduced a mobile friendly version. More and more people are utilising a smart phone to help assist them with the routine tasks in their lives. Whether it be online banking, ordering a pizza or finding directions to the cinema, the smart phone is now a major part of all our lives and is here to stay. And in these modern, fast moving times its important the salon keeps with the demands of their customers and offers them access to salon services direct from their smart phone as well as from their computer. 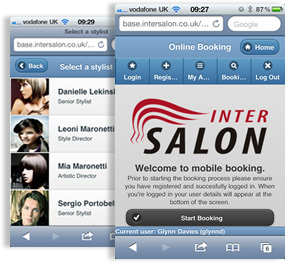 The Intersalon mobile booking system works through the smart phones mobile browser, automatically detects the presence of a mobile device and then redirecting the customer to an optimised web site for mobile online booking. As with the full web version, the mobile online booking checks for availability in salon diary in real time. So when the customer confirms the appointment they can be sure the service has been reserved without the need for any additional work by the salon. The Intersalon mobile booking service also allows the customer to review their current appointment list which is updated each time an appointment is booking and even view their appointment history. With the Intersalon mobile online booking system an appointment opportunity can be searched, found and confirmed in less an a minute. Step 1: The customer selects their required service from a the list of services offered online by the salon. Step 2: The customer selected their preferred stylist. Intersalon will only list those stylists that are trained to perform the selected service.Intersalon understands the relationships between services and will automatically link services and stylists if required. Step 3: The customer selects their preferred date/day. Step 4: Intersalon presents the customer with a list of available time slots for the appointment. Step 5: A summary of the booking with confirmation of the total service price is displayed ready for confirmation.